The SGX reported very good news in their recent quarterly earnings announcement with the majority of the rise in revenue attributable to derivatives. The interesting part of the derivatives growth is the fact that SGX lists many non-Singapore equity index futures contracts. In fact, the fastest growing contract in the quarterly report is the future on the Nikkei 225. I read an interesting post back in January (here) that claimed the SGX Nifty contract had 68% of the total open interest of all available Nifty futures contracts. My thought at the time was “why would the majority of interest in a future on an Indian domestic equity index be offshore?” Time for more research! And a key driver of that growth appears to be the comparative trading costs of Singapore vs the domestic market for the specific contract. As an example, this article shows that the cost of trading the Nifty on the SGX is less than half that on the NSE! The Securities and Exchange Board of India (SEBI) banned participatory notes (p-note) in October 2007 (a p-note allows an investor to trade without registering with the SEBI) which led to a marked increase in trading in the SGX contract. Even though the SEBI then lifted the p-note ban a year later, a significant share of trading stayed on the SGX. Additional uncertainty exists from an investor’s perspective w.r.t. the general anti-avoidance rules in India as well. Some commentators have suggested that the FX component is also of importance as the NSE Nifty contract is delivered in INR whereas the SGX contract is delivered in USD. What do the investors want from the contract? Exposure to the Indian equity market. 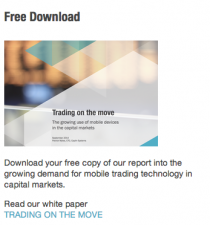 To be able to trade efficiently – quickly & in a cost efficient way. To be able to enter & exit positions quickly. To know that the regulations are not going to change in a way that will add costs to the trade process. For markets, once a significant amount of liquidity (measured by open interest & traded volume) moves to a venue then that liquidity becomes (1) self-generating & (2) sticky as long as the regulatory regime for that venue is stable. When the markets are electronic, that move can happen very quickly. Which is what happened when the Bund contract moved from LIFFE to the DTB (a good summary is here). This dynamic should be understood by regulators when they view the global financial marketplace and is not limited to their efforts to avoid regulatory arbitrage. The individual market participants, whether buy-side, sell-side or execution venues will compete to provide the most efficient service possible. When that service is electronic, the competitive force is instantaneous and the successful participants will adjust to that force in the same time frame.